Back in 2009, we read, loved and reviewed Give Up The Ghost by Megan Crewe. The book features a character-driven story about a girl who can communicate with ghosts better than with living people. It is a lovely story and we truly enjoyed it so when the author asked us if we were up to run a giveaway to celebrate its release in paperback this month, we were happy to accept. So here we are, sharing the love! Note: The new paperback edition includes bonus material that wasn’t available with the hardcover, such as a couple of deleted scenes featuring two ghosts who didn’t make the final cut for the finished book. 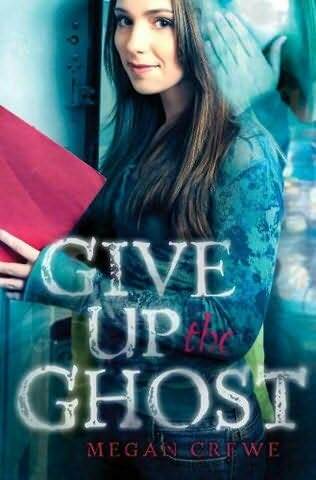 Courtesy of the author, we are giving away one SIGNED copy of Give Up The Ghost to one lucky winner. The contest is open to EVERYBODY and will run until Saturday, April 16, 2011 at 11:59 PM (PST). In order to enter, all you have to do is leave a comment here. Only ONE comment per person, please! Multiple entries and/or duplicate comments will be automatically disqualified. Good luck! Aah, gotta love a giveaway to brighten up a Wednesday morning! This seems an exciting read. And thanks! The possibility of winning a prize can get anyone through Humpday. The book has got some time ago in my sight and not only for its great cover. About a signed copy I would be very happy and so I try just my luck. Looks interesting! Thanks for doing the giveaway. I’d love to read the book, sounds really interesting. Thanks for the giveaway and for making it international! I haven’t heard of this one – will definitely give it a shot! I like a giveaway as much as the next gal. Count me in please. I’d like to read the bonus material. Sounds great, count me in please. And thanks for making it an international giveaway – woo hoo! Ohhh, been wanting to read this one for a while! Thanks! I love ghost stories, and this one looks lovely. I’m a little burned out on YA Paranormal, but your review made it sound interesting so I’d like to give it a shot. How silly of me… I forgot to add my name! (LOL) Thank you for the international giveaway! I love a good ghost story! I read this book last year and really liked it. Wow. Your sneak peek really intrigued me. That’s the good thing about blogs. They whet your appetite for good books. Looks really good – count me in. Congrats on your success Megan! Thank you for the chance to win! Oy,I can relate(except for the ghosts:). Oooh, I’ve been meaning to read this one for awhile! This has been on my to-read list of awhile. Thanks! Fantastic giveaway and thanks for making it international! Have been wanting to read this book…Thanks for making this giveaway international! I’m SO glad ghost stories are finally joining their rightful place in the YA paranormal canon. I love a good haunting, and can’t wait to read this book! This looks like an awesome book. Can’t wait to read it. This is already on my to-read list, thanks for offering the giveaway! Sounds great. Count me in. Thanks for the giveaway. Sounds like the kind of thing the girls in my school will love! Ooh! I’ve been enchanted with the idea of this book ever since I heard about it, but somehow, I haven’t yet managed to pick up a copy. Perhaps it was fate making me wait for this giveaway contest! This has been on my to-read list since your review – thanks for the giveaway! I actually saw a real ghost when I was 4 years old! I scared the wits out of my mother when I told her about the “glowing man” in the house. Of course, my mom immediately searched the house, but the ghost had vanished. So, no one believed me. But it REALLY happened! There ARE ghosts! Looks interesting! Can’t wait to read it! Would love to win this one. Great giveaway. Thanks for the giveaway! I’d love to be entered. This sounds lilke a fun read so please enter me in the giveaway. Just curious if one must read this book in “a certain slant of light”? Boo! This books sounds interesting 🙂 I really want to read it! Deleted scenes in a book, and book trailers? They’re becoming movies! This is a great contest! I hope I win! Sounds intriguing. I’d be interested to read it. I haven’t read YA in awhile. This sounds like a good book to start reading them again. I must have missed this one the first time around, but I love books with characters that see ghosts, so I’d love to win it and I’m adding it to my wishlist. Sounds good, count me in! Great Giveaway. Reminds me of Meg Cabot’s Mediator series. Please, please choose me! I’ve never won anything before. Please, please, please choose me. Thanks! Ghosts in the book? Ok, I want. Please enter me in the giveaway! I’d love to play please. Beautiful cover. Sounds like a good read. I have a copy of the paperback release ordered (the cover is gorgeous) but I’d love to have it signed. *waves hands wildly in the air* Pick me! Pick me! Not only does this book sound quirky and cool, it’s the best possible way to procrastinate. This looks interesting. I definitely want to check this series out. Thanks for the giveaway! This book sounds really good! I especially like the mysterious Tim. Looks interesting. Thanks for the giveaway. Beautiful cover and the story sounds great. Thank you for this giveaway. this really was a great book. love to have it on my shelf. I love books about ghosts. Would really enjoy reading Cass and Tim’s story. Please enter me. Thanks! Thanks for making this open internationally! I’d love to win this book.Sounds really interesting! wow. love the story of this book. would love to win 😀 thanks for the giveaway! Gotta love a good ghost book! There aren’t that many out there that center on ghosts. I’m interested in the giveaway! Thanks! Wow, so many comments! I am always looking for new YA to share with my kids. This looks like a fun read. This book sounds really good 🙂 I hope I win! I’d love to win a copy of this book! I’ve heard such great things about it. This sounds like a book I would really enjoy! Thank you for the giveaway! This looks really good. COunt me in! Aren’t we all a little afraid of living? Would love to have this book! I always wanted this book.